Lighting Sensor IC with Embedded Algorithm. integrated proprietary algorithm to detect the presence and approach of lightning up to a distance of 24 miles.The sensor then provides for an estimation of the distance to the head of the storm. 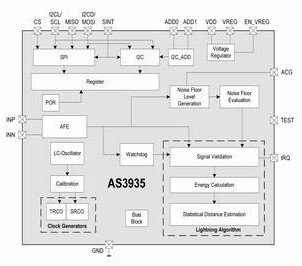 The AS3935 Lightning Sensor has a high degree of accuracy both cloud to ground and cloud to cloud. The Franklin Lightning Sensor is the world's 1st lightning sensing IC that was designed for low power, portable or fixed wire-line applications. It also has an automatic antenna tuning which increases sensitivity and it can distinguish between man-made signals such as motors and microwave ovens. Because of its low power consumption and small size, it is ideal for small, portable battery-operated devices. This advanced warning capability alerts users so that the necessary precautions can be taken to protect individuals and equipment from hazardous and deadly lightning strikes. In stock! Call 727-532-6144 for a quote today!